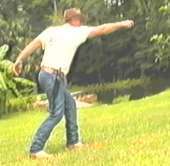 This instructional video, the sequel to Recreational Knife Throwing , is intended for the advanced thrower. The basics of knife throwing are covered only briefly, although John Bailey demonstrates an interesting device that helps to correct the common mistake of side-arming. Johns shows through his collection of throwing knives, explaining what purpose each knife is best suited for. He gives recommendations what kind of knife is best for shows and what for (US-American) competitions. Of course, you will also get to see quite a few unusual throwers from his collection (some of them in action). Various throwing styles are briefly demonstrated. The slow-motion sequences really give you the idea of how the throw should be done. Very interesting are the different methods of underhand-throwing shown. All in all, this 34-minutes video is something for the advanced knife thrower who craves new ideas. The non-standard throwers and various throwing styles will give him enough to think about and try out. The author sells this video via his website in various formats, including NTSC-video-cassettes (which run only on US-video recorders), and DVD.